The GDPR compliance regulations have swung into full effect but many businesses are still scrambling to get their GDPR policies and procedures in order to make sure they aren’t at risk for hefty fines. From small businesses, to enterprise corporations, GDPR affects any company worldwide that processes the personal data of EU citizens. However, not all companies have a security expert on staff to help navigate the rules and regulations of GDPR. This is where partners come in. Partners can team up with data management companies, like RingLead, which can help businesses start their journey to becoming GDPR compliant by cleaning, protecting, enriching and normalizing all of the data within a users CRM, and refer and resell these types of technologies on behalf of the company. This is a great opportunity for partners because this type of relationship helps connect the company to new customers, takes the stress off the customer by not having to research, buy, and implement the technology themselves, and rewards the partner monetarily for bringing in new customers to the company. Do you know the type of data you have for each record in your database? Do you know who has access to the data in your database? Do you know if your data is secure within your database? Do you know if you have a way to easily delete PII if asked to? Do you know all of the entry points of data into your system? Do you have a way to verify the information within your database? Do you have a system in place to clean and maintain the data in your database? Asking these types of questions will guide you in understanding if and where there is a need for additional support. It is more than likely that a company is not perfect in any of these areas, and partnering with data management companies, like RingLead, can help bridge the gap between companies who need help with GDPR compliance, and companies who provide technologies to help with GDPR compliance. Clean standardized data is the first step to GDPR compliance and RingLead Data Management Solutions can provide just that. RingLead DMS is a cloud-based, fully scalable, data management platform that can clean, protect, enrich, and normalize the data in a users database in real-time, to help maintain the health of a users CRM. RingLead DMS Cleanse and Duplicate Prevention can clean out and prevent duplicates from entering a users database by using over 55+ custom matching logic rules to detect and merge duplicates. Imagine you have successfully removed a person’s record with their PII information, but missed the duplicate with similar PII. You attempt to contact them using the information in the duplicate record and unknowingly have violated the GDPR law. RingLead DMS Enrichment can help companies comply with GDPR laws by providing verified contact information like direct dials, mobile numbers, and email addresses when adding and enriching sales or marketing leads. With verified contact information, your customers will have peace of mind before reaching out to prospects, and also ensure that they are sent the appropriate marketing material. Ready to start referring or reselling RingLead DMS to your customer base? 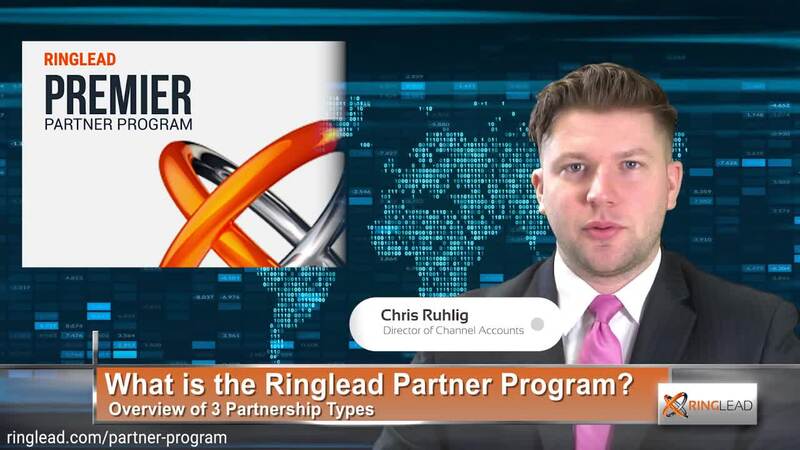 RingLead’s Premier Partner Program provides extensive resources, collateral, training to support your business, and increased profitability with our industry-leading data management solutions. With our partner program, you’ll earn high commissions and instant spiff money on every deal reg that moves from quote to close. Better yet, you can track the progress of every deal from registration to close in RingLead’s Partner Portal so you are always up to date on your latest deal. Register for RingLead’s Premier Partner Program and start earning today by clicking the box below! PreviousPrevious post:50 Tips for a Great Sales VoicemailNextNext post:RingLead is Hiring! Join The Revolution Today!